The Original Ice Genie™ Ice Cube Maker is the perfect solution for saving space in your freezer. The double chamber design can hold up to 120 ice cubes and each use makes 40 cubes at a time! The outer chamber freezes the ice cubes and the inner chamber stores them. Tight seal lid helps keep your ice cubes fresh and free from any odors! Can also be used as a drink cooler. 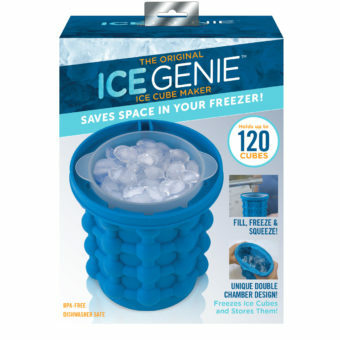 Ice Genie™ is made with safe, BPA-free materials and is top rack dishwasher safe.